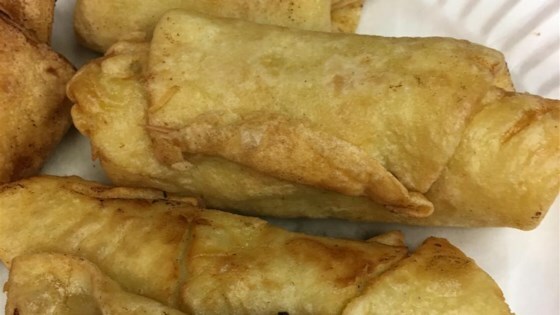 "Homemade egg roll wrappers can be a real treat for the self-sufficient cook! Getting the wok to the correct temperature may be a challenge. If the batter sets before the wrapper is fully formed, the wok is too hot; if the edges are thin, it's too cool. Experiment and enjoy!" The egg mixture for these wrappers came out way too thick & lended a very doughy and chewy texture. Am I doing something wrong? Tasty, easy and great to use! Try them with the sambusa recipe here on allrecipes, or eat them by themselves. I found that a skillet was much easier to use than a wok. Excellent! I added parsley flakes for color and some onion powder for a little flavor and they were super! This a great recipe. (I have used thhis recipe for more than 30 years) I often have to double or triple it. If you have any dough left - bake it with cinnamon and sugar as a treat.